While Marshall excelled with darting runs, subtle passes, a dropped goal and the short-range burst for the final try, Andre Snyman, Lomu’s direct opponent, plundered two tries, the first from 50 metres. WINNING the battle comprehensively did not enable Leeds Tykes to triumph in the war and qualify for the Heineken Cup quarter-finals at Headingley Carnegie. They swept aside Cardiff Blues with contemptuous ease but results elsewhere meant they failed to go through to the last eight. The European odyssey of the Tykes, who are bottom of the Premiership, has been nothing less than remarkable, with this emphatic win topping the curiosities of beating Perpignan with the last kick of the match through a twice-taken conversion from Gordon Ross and the decision by the board of the European Rugby Cup Ltd to set the astonishing precedent of awarding them five points for the twice-postponed match against Calvisano last week. Leeds’s task of of qualifying for the last eight was always going to be tough, but that they came so close was remarkable. They needed five tries along with victory to even stand a chance. Running in seven, however, brought accolades, not only from Davies but Justin Marshall, the New Zealand scrum half and man of the match. “It was a complete team performance and we were proud of it,” Marshall said. Marshall prospered while Jonah Lomu, his former New Zealand team-mate, failed to add to his single Cardiff try in six previous appearances. David Young, the Cardiff head coach, said: “We were unable to put together three or four passes. Our team has to play with tempo but Leeds dominated the tackle area. We do not have the firepower behind to play going backwards. We were hammered. To say I am disappointed is a huge understatement. Tom Biggs flitted in and out of the match, bewitching Cardiff and being rewarded with a try. David Doherty, another product of Leeds’s academy, pounced for another after seizing a kick from Ross, the fly half, who illustrated why he is back in the Scotland squad for the forthcoming RBS Six Nations Championship. Tom Palmer was driven over from a lineout catch by Stuart Hooper that gave Leeds a 24-3 lead at half-time. A penalty try when Martyn Williams handled the ball in a Leeds scrum after 56 minutes simply confirmed Cardiff’s woes and Leeds’s dominance. SCORERS: Leeds Tykes: Tries: Snyman 2 (13min, 45), Palmer (30), Biggs (37), penalty try (56), Marshall (65), Doherty (78). Conversions: Ross 5. Dropped goal: Marshall (6). Cardiff Blues: Penalty goal: Macleod (33). SCORING SEQUENCE: (Leeds Tykes first): 3-0, 10-0, 17-0, 17-3, 24-3 (half-time), 29-3, 36-3, 41-3, 48-3. 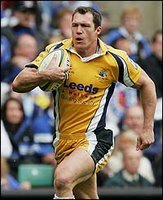 LEEDS TYKES: R De Marigny; A Snyman (rep: D Doherty, 66), R Vickerman, C Bell, T Biggs; G Ross, J Marshall (rep: D Care, 66); M Shelley (rep: R Gerber, 60), G Bulloch (rep: R Rawlinson, 60), G Kerr (sin-bin, 70-80), S Hooper, T Palmer (rep: J Dunbar, 66), S Morgan (rep: M Shelley, 77-80), R Parks (rep: D Hyde, 77), N Thomas (rep: R Reid, 60). CARDIFF BLUES: R Williams; C Czekaj, J Robinson, M Stcherbina (rep: T Davies, 80), J Lomu; N Macleod (rep: L Thomas, 57), M Phillips (sin-bin, 54-65; rep: R Powell, 65); G Jenkins, R Thomas (rep: D Goodfield, 72), M Jones (rep: J Yapp, 51), D Jones (rep: C Quinnell, 57), R Sidoli, A Powell (rep: R Sowden-Taylor, 54), M Williams, X Rush. Sheesh, Snyman is built like a brick sh*thouse, I'm glad I never ran into him. what a player - i will never forget that try against the english @ twickers in 1998 was it? Man - that tour was so awesome. I've never seen the boks play better. yeah and he is still loosing it at WP now as well. man we had some great players in that team. comparing man for man, i think on every level, that team will make up 80% of a team today judging against guys from we have now. Hell yeah. There's just no substitute for Andrews, Venter, Teichmann, Lem, Snys... and the Monty of that era! Just finished reading Teich’s autobiography, NM sure did lose it after 98, apart from the Skinstat syndrome I wonder what his thinking was. Andre was in the same class as my daughter at school, he was brilliant from the first day I saw him in Std 6. I must say he has bulked up a lot since those days. A very friendly and humble young man. jj - don't tell me you're another Dundee old boy? Not me, but my wife, both my sons and daughter finished school at Dundee. The kids were in the hostel as we were at Babanango at the time. Ok, cool. I lived there from 81 - 87, although I left before High School. Ironically enough, though, I used to work for a chap that was also went to Dundee High at the same time as the Snymans, although he was better friends with Andre's boet. wow JJ, you just gave away your age! No PA it wasw 1997.
yeah, jj - you must be even older than davids! My age is no secret, but I enjoy the banter of you youngsters. Retirement is overated and boring. Just you wait till I get my walker over to where you are and I can moer you with my walking stick. Anyway, that lasted exactly 2 years and then he restarted a new business.